← God and Computers! God Challenges the Kings of the Earth! (Ver 1.1) This is now Part 7 of a series of studies about the spiritual reality of angels found in the Bible. We have covered a lot of information that is not going to be repeated, so if you have not read all of these lessons from the beginning, I would recommend that you go back and start with “Part 1” and read forward to this lesson. In the past we have been discussing the physical makeup of angels, where angels come from, the dimensions of angels, the assignments of angels and we have learned that they are intended to be a beneficial spiritual force that works for us and with us. Christians and the angels of God are on the same spiritual team and we have the same God. But, we have also seen battles, conflicts and the realities of other angels that are not working for God. These evil or unclean angels are God’s enemies and we will discuss them more in the future. 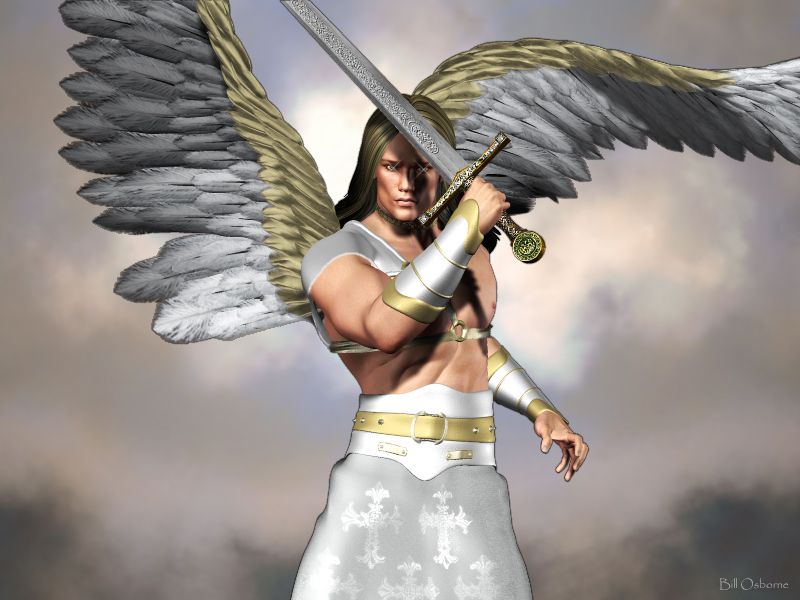 Today I want to discuss a different purpose of angels of God found in the Bible. I believe that God has assigned specific tasks and responsibilities for angels to follow. These are generally followed for our benefit, but angels never override your will unless there is eminent danger. If you recall we studied the story of Lot in Sodom and God sent two angels to his house to get him and his family out before the city was destroyed. These angels practically had to drag this family away from the city by the hand, because they did not want to leave. I do not know if it was a case of core unbelief or just the fact that they thought they belonged there in the city. We did see that Lot left two daughters in the city that were married and they would not leave with them, so this might have contributed to the hesitation. However, if they would have stayed in Sodom they would all have been killed that very day by the falling fire and brimstone from heaven. Of course the only reason they were saved was because God talked with Abraham and Abraham asked God to spare them. So really Lot had nothing to do with his salvation other than allowing the angels to guide them out. He was very fortunate that he had an uncle that knew a God who was merciful. Many times angels will do this for your unsaved relatives also if you ask them to. So what we learn from God’s story of Sodom is that angels can protect people from a pending disaster, either natural or supernatural. Therefore, one of the key assignments of angels given to them by God is to protect those who are heirs of salvation. Here we have a verse where Jesus is speaking about the little children that have been brought to Him to be blessed. Jesus tells us that these little children all have “their” own angel. These angels go from here to heaven and when in heaven they check with God and see what God says for them to do. Since God does not show any favoritism to anyone we must logically conclude from this information that every child born on the earth has an angel assigned to them. The population of the earth is currently less than 7 billion and in the book of Hebrews God tells us that the total number of the angels in Heaven are innumerable. Men can easily count to a billion and even a trillion if they had enough time or could just use a computer. According to Revelation 12 we know that 1/3 of the angels have been cast down with Satan to the earth. Therefore, we can clearly observe that even taking away 1/3 there are potentially more than enough angels to go around to watch over 7 billion people. Let me tell you about some personal experiences that I believe that angels have come to my aid in my past. One day as a young man I sat in my car at a red light in the left turn lane waiting for the light to turn green. I was the first one in line and just sat waiting for a green light to go. Suddenly a dump truck ran over the front of my car and crushed it. It seems this truck was coming down the hill to my left and lost his brakes and the driver of the truck could not get it to stop when the light was changing. I never heard anything or saw anything that was about to happen. So the driver came down the hill without brakes, without sounding his horn and he was trying to weave and dodge everyone as he came down the hill without any brakes. He missed most everyone except my car. However, if I was 5 or 6 feet closer into the intersection or the light had turned green I would not be here today. A man I knew saw me right after the wreck of my car and stopped to talk to me. He said I was very lucky to have escaped harm and he was right. You see I did not see any angels present that day, but yet looking back on it I can see the hand of God that spared me so I conclude that an angel was at work that day doing something to help me. It could have been just to cause the light to stay red long enough for me not to go forward. It could have been to tell me to stop and not inch any closer into the intersection. It could have been helping the driver of the truck to know how to turn and when to turn the wheel to keep from killing anyone. I mean we do not know all of the possibilities that could have been affected by an angel’s help. It is very difficult to know when something like that happens all of the factors that went into that day’s activities for everyone involved. I mean I could have been a few minutes later and missed everything or I could have been a few feet forward and been killed. Then later in life I was attending a church gathering at a large convention center in downtown Dallas Texas. It was very late at night and the service was still going on, but I decided to take my kids home to get them into bed. So we left early and started for where I parked my vehicle about three blocks away. I noticed as I walked down the sidewalk that there was no one else around anywhere and that concerned me. We had to go close to 3 blocks to get to my car and it was very dark except for street lights. Suddenly I noticed two teenaged punks up ahead of me nearly a block away on the other side of the street. Then I noticed them looking at me and taking something out of their ankles like knives or weapons of some sort. I knew this was not a good situation to be in with two small young children. I was carrying my youngest child and my eldest son walked by me. I saw that the punks crossed the street so I crossed the street at the same time in the opposite direction. They suddenly realized that I had changed my course as they were coming towards me. I remember praying to God and “pleading the blood of Jesus” over my situation. I grabbed the hand of my son and we turned to walk back towards the convention center down the middle of the street. Suddenly a group of people appeared out of nowhere. There were probably four of them, two men and two women so I started walking towards them and arrived at them at the same time as the two teenaged punks so I turned and stood by them and we all stopped to look at the punks. The teenagers were outnumbered at this point so they asked some dumb questions acting all innocent and then ran off. I walked with this people for a little while never saying anything to any of them about what just happened. Suddenly again one of the women turned to me and said “Thank you” and they went on into the night and disappeared. So why was someone that I did not know telling me “Thank you” with me not saying anything to them at all? I have asked myself that question many times and can only come to the conclusion that it was because I prayed and ask that God cover us with His shed blood. So were these angels sent from God or were these just people who happened to be at the right place at the right time for me? I don’t know! I just believe that God answers prayer and how He does it is not up to me. I cannot tell this story without tears coming to my eyes thinking about it. So those were just two examples of how angels could have affected a positive outcome in a potentially negative set of circumstances. One time I saw nobody and the other time there were people involved that I saw. I have heard many times a minister of God say this, “People are looking for the spectacular and all the time missing the supernatural”. In other words they read their Bibles and want God to do something like part the Red Sea for them or appear in a burning bush and God does not have to do something like this to cause a supernatural event to transpire and save your life. I’ll give you one more example of someone I knew. He was working very late one night at the office and he had his little daughter with him there at work. They decided to go home and of course it was dark and everyone else was already gone. As he loaded his daughter in the car and put her in her car seat a man with a gun came up and told him let’s go back inside the office building. This man that was being robbed with his daughter was the type of man that carried a licensed firearm with him for protection, but it was in his brief case in the front seat of the car. So he told the gun man I have my wallet in my brief case and reached in and his hand fell on the gun in the exact perfect way so that he just grabbed it and pointed it and began to shoot it at the robber. The man was hit several times but did not go down. The robber pointed his gun at the window of the car where the daughter was and pulled the trigger and guess what, the bullet bounced off of the window. The car did not have bullet proof glass and this should not have happened. So was this a chance accidental occurrence that everything just worked out like it did for the child? You have to be pretty blind to think that it was. I am confident that the angel of God was present there to help and to save the little girl who is still our friend today as a 13 year old young lady. Can angels stop bullets? I believe that they can, what you believe is your choice. So God tells us in the Bible that the angels of the Lord are present around those that have respect for God. Therefore, those who do not fear God might have a problem. It would be good to hear God say that we have an angel that is with us, but it also much better to hear Him say that one of their assignments is to help deliver us from something? What we need to figure out is what it is that they deliver us from? I believe that we only need deliverance from something that is intended to do us harm or hurt. Do you understand this? What is this trying to tell us? If angels can deliver you then other angels can also do things to you to cause you harm. That is just a basic reality found within the spiritual realm. Satan wants to kill you and God wants to save you and we have the classic battle of good vs. evil in our world transpiring all around us every night on the evening news. So how does Satan cause things to happen to take you out of the world? Many times Satan influences and uses people to hurt other people. Just as good angels can influence good people to do good things, Satan can influence and suggest that evil people do bad things to hurt other people. We have not discussed demons and evil spirits yet, but the Bible says they exist and we will definitely talk about them later. You can read another story of angelic involvement with the children of Israel leaving Egypt. In this story God says that an angel appeared before them to help guide them. The children of Israel make a camp and the angel moves to the rear of them for protection. We can clearly see that angels give God’s people a layer of protection from their enemies of Egypt who were pursuing them to take them back. This is not ministering “to” them; this is another example of angels ministering “for” them. We can clearly see that “protection” is one of the primary responsibilities for angels. You can also assume that Satan was influencing Pharaoh to pursue God’s people to do them harm. This is another example of how angels can affect the outcome of what happens in the world. So I hesitate to mention this verse, because it says the angel was guiding Israel in the way that they should go. However, it will be a good opportunity to teach you something about the role of angels in the church. Angels can clearly give people direct messages from God. We can seen this happening repeatedly in the Bible. These words from God can be considered guidance. You can even see this in examples found in the New Testament. However, many times these angels brought news from God about pending disasters. For example, Paul’s ship wreck in Acts 27:23 was foretold to him by the angel that he would live through it. But, here is the problem; I have not found a verse of scripture that tells us to pray for angels to lead us. The Bible in the New Testament says that those who are led by the Spirit of God they are the sons of God (Rom 8:14). So it appears to me that today we are to be primarily led by the Spirit of God that lives in us. This does not mean that God cannot still send you an angel if He chooses to do so. However, it is God’s choice and not yours. Do not put God in a box and think that an angel is the only way God can do anything for you, just leave the option open if God so desires. I have heard stories of people who prayed for angels to appear and Satan shows up to give them a message like it was from God and this was nothing but a way to deceive them into doing something not in line with the will of God. The Bible clearly says that Satan can disguise himself to appear as a messenger of light (2 Cor 11:14). So if you pray and ask for angel and are not promised one in the Word of God, then you are asking and praying for something out of the line of God’s purpose and plan and this normally just opens the door for Satan to come in to deliver his message of deception. There are many verses in the Bible where angels are used by God to protect and deliver His people, so I will not go through all of these. I will briefly talk about Peter being thrown into prison by Herod in Acts 12:5. In this chapter you can see that Peter was being persecuted for preaching the truth. Thus we have Satan influencing Herod to do God’s people harm and Herod later finds out this was a mistake that he should not have made. In verse 5 of Acts 12 you see that the church was praying for God to deliver Peter and they continued to do this until Peter showed up at their door one night. God ends up sending an angel to wake Peter in the jail and this angel walks him to the house where the church is meeting. The angel is able to bypass the guards, release his physical bonds and open doors supernaturally to get Peter out of prison. This is a supernatural event of the divine intervention of God of how an angel can be used to deliver anyone from harm. Peter would have been executed the next day if not for the angel of God and the prayers of the church. This is another example of how angels are sent for the words of people on the earth. If there had been no prayers or words spoken there would have been no deliverance for Peter and we would have a few less books of the Bible to read today. Please notice that spiritual angels can affect an change physical things and outcomes. I’ll end this lesson with another example of how angels can potentially work in the earth and you not see them or know of their involvement. In an earlier lesson I told you that the towers in NY on 9/11 were amazingly empty compared to normal capacity. My wife knew one man in NY that was supposed to be in the tower giving a presentation for his company. This was a very important meeting and one that he should never have missed. However, something transpired that day that was not expected at home and he was forced to stay home with his family that day. Because he stayed home we can only assume that this saved his life. The company that he worked for and the company that he was presenting to both vanished that day and do not exist anymore. So what appeared to be important that day turns out was not very important in the grand scheme of life. Were angels involved in this one case, again we do not know but yet something happened out of the normal course of life that caused a dramatic different result. I personally believe it was an angel, but you can believe whatever you like. So I am personally convinced that angels do supernatural things to help people when someone asks God to help them. It doesn’t have to be you praying for yourself either. It can be like Peter when it was the church that prayed for his deliverance or Abraham speaking to God for Lot’s benefit. Ask God to get involved in the lives of your friends and relatives and see what happens. I am a firm believer that we are not done with evil in the world. I believe the terrorist and evil people of the world are hard at work coming up with new ways to hurt people. By releasing the angels of God to help protect us is one of the best defenses that we can possess against this spiritual evil. If you have personal stories of how angels helped you out of a bad situation I would be very happy to hear about them. I’ll end this lesson here for today and pray that you have a very blessed day. If you would like to continue reading this series of lessons on angels you can continue with “Part 8“. Posted on October 23, 2010, in Angels, Bible Study, Understanding and tagged angels, Bible, Christianity, Church, God, Holy Spirit, Interpretation, Jesus, Prophecy, Religion, Revelation, Salvation, Satan, Truth, understanding. Bookmark the permalink. 4 Comments. Not my personal story but one I often share anytime the topic of angels arises. A friend of mine had a live in boyfriend at this time and was often physically abused by him. One night, they were tucked into their basement apartment, doors bolted and locked and in for the night. For whatever reason, he began to punch and kick her. He was so upset with her that he picked up a blunt metal object and held it over his head ready to strike her with it. My friend was crouched in the corner and was convinced that she was going to die there on the floor in that apartment. Just before he bought it down on her, the door burst open and the guys brother stood at the entrance and said “No, no (guy’s name) please don’t do that!” The guy and my friend looked in amazement because they KNEW the doors were locked AND bolted. The guy put the object down and “the brother” left. Afterwards, the guy immediately went to bed. My friend could not sleep a wink, but she also was not killed that day. I asked my friend how did the brother get into the house? She said she didn’t believe it was his brother, she believed it were an angel. I do too! I needed to warm water to bath and i had to use the gas cooker to warm the water it was around 11 pm. and i mistakenly over slept.. and you know it normally takes about 15 minutes for the water to to move from warming state to boiling level.. I slept from the 11 pm till the following day dawn around 4 am that is about 5 hours. As my eyes opened i rushed to the kitchen and to my amazement for about 5 hours the water had been on the gas cooker it had not gotten to the level of boiling and the water in the bowel was at the same level it was as i put it on the fire..Under normal circumstances i shouldnt have woken up to see any water in the bowel since it takes just about 15 minutes for the water to boil and since the water had been on the gas cooker for about 5 hours all the water should been boiled and evaporated for the bowel to get heated to an extent whereby it will eventually set the house on fire…i realized on the spot there had been a divine angelic intervention. Thank you for your testimony. God Bless you.